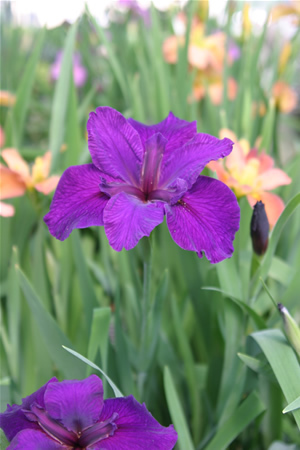 Louisiana Irises enjoy full sun to partially shady conditions. These beardless hybrid irises have a full line of colorful members. They have a fine strap like foliage that remains evergreen in warmer climates. This group of iris is not fully frost hardy in colder climates but will withstand light to moderate frosts. Louisiana Irises are basically swamp or water plants but are very happy garden plants if kept well watered. Iris ‘Jeri’ has flowers that are flaring dark grape-violet with inconspicuous yellow signals. Plant height is 38 inches and the plant forms very stunning clusters in the garden. Developed by Bertinot, N. 1984.